In the past year America has seen a new musical invasion. The Dutch Female Invasion includes many fine female fronted bands from the Netherlands including Epica, After Forever and the clear leader of the pack Within Temptation. New York City had the privilege of seeing this sensational band put on one of their first headlining shows in the United States. Within Temptation brought with them a stage show as beautiful as singer Sharon den Adel's voice. If you are looking to be blown away by a live show then search no further than one of their gigs during the month of September. As the band entered to the chords of "Our Solemn Hour" the packed crowd let out cheer after cheer as Stephen, Martijn, Jeroen, Ruud and Robert entered the stage. When Sharon finally came on stage the crowd was up to a deafening roar. From that moment on Within Temptation showed why they are considered one of the best live acts in the female metal community today. Sharon has this magical way of connecting with the audience during a show. She makes sure to look the crowd in the eye and let them know that she is singing for them. As the audience sang along to the chorus for each song Sharon would give a thumbs up to each individual person who was singing with her along the barricade. This is the kind of showmanship and command of the stage that separates Sharon from many of the frontwomen out there today. The rest of the band also knew how to bring energy to the crowd. They bounce up and down in sync to the pounding beats of their symphonic music. They also move around utilizing all of the space available to play their guitars in matched swaying groups at different ends of the stage. Ruud has this constant smile on his face showing how much he enjoys playing for the crowd. He spends a lot of time mouthing the words to the audience as Sharon sings the songs. He also dances with Sharon as she sings directly to him during a few songs and the chemistry is electric. Robert spends a lot of time clapping his hands and getting the crowd to clap along. He also makes sure to talk with the crowd and let them know how happy the band is to be playing in New York City. In the back of all this Within Temptation has a giant backdrop which features the dark landscape designs seen on their website. On the lighter parts of the backdrop is a video projection monitor which the band uses to display animated logos throughout the production. They also use clips form some of their outstanding videos such as "Angels" and "What Have You Done" as those songs are played. To see a band bring such an elaborate stage setup for their first headlining tour of America is special. The fans get not only the amazing music but also an amazing visual feast with the video and lighting effects. Turning to the music again, Within Temptation plays an extremely flawless live show. To hear them in concert is equivalent to listening to their CDs. They really are that great on stage. The band is tight and bring their instruments to life on stage. Sharon is a phenomenal vocalist and displays the same range in her voice as she does in all of her recordings. She is spot on in concert. The music and showmanship of the band made it very easy for the crowd to cheer and sing along at every opportunity of the night. And cheer they did through a 16 song set including a variety of songs off of their latest release "The Heart Of Everything" as well as many songs off of older albums "The Slient Force" and "Mother Earth". Sharon had the crowd singing from those first chanting choruses of Sanctus Espiritus in "Our Solemn Hour" to the Ah Ah's of "Ice Queen". It was amazing to see the crowd knew not only songs on the new album (which is the only one released here in the US) but also the older songs from the band. Within Temptation had smiles all around as they saw that the crowd was singing along and knew their whole catalogue of music. Some standout songs from the band included "Stand My Ground" and "What Have You Done". During the latter song Sharon passed her microphone into the crowd and had one of their fans Anthony sing Keith Caputo's parts of the song. This brought such joy to Anthony and the crowd as Sharon let them be a part of the song. Sing alongs were a plenty the whole night and the audience threw back every chorus Sharon asked for. Another highlight was when Sharon took to the stage for a vein chilling version of the ballad "All I Need". For those in the crowd who were energized by the upbeat symphonic songs Within Temptation played earlier in the night "All I Need" was the first time they could get a tingling in their spine as Sharon sang with her soft, beautiful voice. Her performance of this song showed why she is one of the most talented singers in our genre. To keep such a steady pitch while there aren't loud guitars backing the vocals is a tough task for any singer and Sharon handled it wonderfully. As the band finished their main set with "The Truth Beneath The Rose" they got a full hands up ovation from the crowd during their first set of bows. The crowd showed their appreciation for the mixture of great songs on the setlist. Coming back for an encore the band played one of their older songs "Deceiver Of Fools". The introductory music for this song brought some more anticipation from the crowd and there were cheers again as each of the members of Within Temptation came back on stage to soak up the applause. 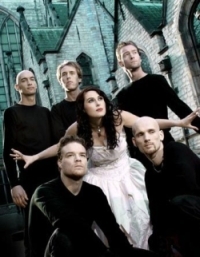 As has been the custom for Within Temptation the past few years in Europe they ended the show with their first hit single "Ice Queen". Sharon had told me before the show that it was a tradition for the band to play this song to close their set but she wasn' sure how well it would go over in America since most people here don't have the "Mother Earth" album. Her fears were alleviated rather quickly as she asked the crowd to sing Ah Ah and they sang it back as though everyone in the venue were old friends. This started a riveting rendition of the song where the whole band used their trademark moves on stage for one last time. Now Within Temptation knows they can end their American shows with the same tradition they use over in Europe. As the band took their final bows and handed picks and drumsticks to the people still standing along the barricade the night came to an end. This was one show that people would never forget. Electric from beginning to end. On an very hot night in New York the hottest thing was Within Temptation. Robert even took the time to ask people who took pictures to send them in to the Within Temptation website as the band was extremely happy with their performance. The people leaving the show knew they had seen something special that night as well and were talking among themselves hoping that Within Temptation would soon be back for another headlining show. From the energy throughout the night it seems like an inevitable conclusion that America will get the chance to see this marvelous band many more times in the future at bigger and better venues. For now those in the midwest and west will get to enjoy Within Temptation for the rest of the month.